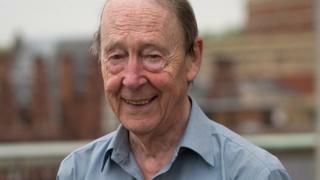 Prof Sir Tom Kibble has been posthumously awarded the highest UK honour for physics. Prof Kibble has been awarded The Isaac Newton Medal by the Institute of Physics for his outstanding lifelong commitment to the field. He is noted for his work in the development of theories about the Higgs boson. Many believe Prof Kibble should have been awarded a Nobel Prize for his work. Prof Kibble, who was 83 when he passed way last month, was admired as much for his kindness and humanity as well as his contribution to physics. His peers and colleagues say his work reshaped the landscape of theoretical physics. The President of the IOP, Professor Roy Sambles, said he was delighted that Prof Kibble received the award. "The award is recognition of his contributions to mankind through his insight into the origins of mass and also through establishing astroparticle physics as a new branch of physics," he said. "Notwithstanding his achievements, he remained a modest man of quiet distinction and dignity, respected by all who knew him, the many students he lectured and supervised and the academics he collaborated with. In very many ways he was an example not just of how to be an excellent creative scientist but how to behave towards others. "He is a truly outstanding winner of the Isaac Newton Medal." Prof Kibble's theoretical work on the development of the Higgs mechanism, the way in which particles acquire mass, was heralded by the journal Physics Review Letters as one of the most important research papers of the last 50 years. His friend and former colleague Prof Sir Peter Knight of Imperial College London and a former IOP President believes that Prof Kibble made the most important contribution to the development of our understanding of how the so-called Higgs mechanism operates. "He was someone who did not follow fashion. He really felt that it was important to get to the heart of problems in a systematic way. It was Tom's vision and insights that led to a deeper understanding of the Higgs mechanism and connected it with the Standard Model and it led to so many other things in physics."